Thornton occupies much of the west bank of the South Platte River just north of Denver. It’s beautiful country that for more than 100 years was very productive farmland. In the early 50s however all that changed when Sam Hoffman purchased a large piece of that farmland and used it to lay out an entirely new town. The town he envisioned was to become the first community in Adams County that benefited from comprehensive planning right from the start. Hoffman and his associates thought through every aspect of the new town’s organization from its tax structure to trash pickups and then named the new town after the former Governor of Colorado, Dan Thornton. Thornton as an idea caught on quickly and within just a few years of being established had over 5,000 full time residents. In 1956 the town was officially incorporated and has continued to grow at a remarkable pace ever since. Thornton today is a thriving, prosperous community that physically bears little resemblance to the tract of land Hoffman purchased more than 60 years ago. The constant substantial growth that is one of the city’s hallmarks might have overwhelmed other towns but not Thornton. That town of 5,000 has some 135,000 residents today who occupy a variety of new and new-ish homes in styles ranging from Bungalows, to Ranch and Raised Ranch to Post-modern and a fair number of custom designed homes as well. But while the city sports a variety of different home styles all of those homes require first class garage door services. Chain drive openers: The chain drive opener is the most basic and also the most popular of contemporary garage door openers. Chain drive openers can be a bit noisy at times, especially if they’re getting on in years. They are however, economical and dependable. Belt drive openers: Whereas a chain drive opener uses a chain to transfer the power of the motor to the act of lifting a belt drive uses the type of belt you find in an automobile engine to do the same thing. Belt drives are typically affordable and quieter than chain drives. Screw drive openers: The screw drive provides a more direct transfer of energy from the motor to the act of lifting the door. The screw drive is less susceptible to breakdowns than the systems mentioned above but you’ll pay extra for that heightened reliability. Jackshaft drive openers: The jackshaft style opener is considered to be very reliable. With this type of opener the motor is mounted to the wall next to the door and the application of force is very direct with little loss of energy. The jackshaft is often favored by those who aren’t able to attach an opener to the garage ceiling. Garage door springs are the unsung heroes of the garage door system. Without them there would be no garage door opener and indeed you wouldn’t even be able to open the door manually. The springs engage when the door is in motion and take on most of the weight. 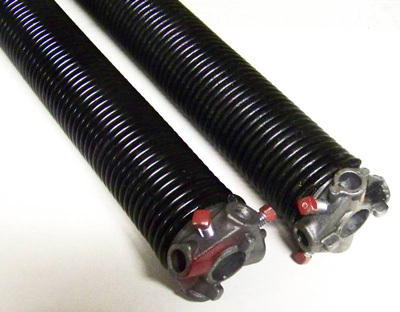 There are 2 different kinds of springs used in garage doors today; the torsion spring and the extension spring. Torsion springs coil and uncoil while extension springs, as you might imagine, extend and contract. 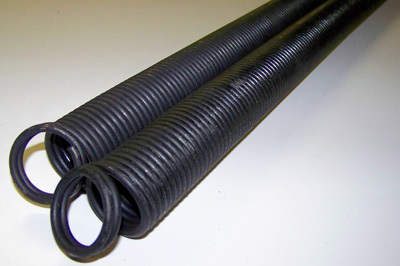 The typical garage door has either 1 torsion spring located over the door or 2 extension springs located over the tracks near the garage ceiling. The door not opening or closing smoothly. The door dropping suddenly while closing. The door not closing or opening all the way. The door lagging on one side while rising. Difficulty raising the door even with the motor deactivated. Regardless of what you may have seen on some DIY TV shows you should never try to fix or replace garage door springs yourself. They can be extremely dangerous. A Better Garage Door is the premier garage door repair company in the region because our customers know they can depend on us time and again for high-quality work at affordable prices. Our reputation for reliability has been earned over our 23 years of service to the region but we’re not about to rest on our laurels. We approach every project as if it’s our most important because it is. When you call A Better Garage Door for repairs our technicians arrive when they’re supposed to and are fully prepared for any situation. We know every style and brand of door that’s in use in Thornton and always have the parts and equipment necessary to get your door back up to speed quickly. We also understand the need for communication so if you have any questions or concerns about the course of action we’ve chosen feel free to ask and our techs will be happy to explain what they’re doing and why. While garage doors are hardy pieces of home technology they’re not indestructible and they don’t last forever. At some point, if you own a particular home long enough, you’ll need to replace it. When that time comes trust your new garage door installation to the company that has done more of them in Thornton and the surrounding area than any other: A Better Garage Door. We install only high-quality automatic garage doors from the best manufacturers like Martin Door, CHI and Amar and every one of our installations will stand the test of time. If you need a custom door for your home A Better Garage Door can do that for you as well. We’ll create a custom door that will seem like it was designed by your home’s architect specifically for use on your house and your house alone. You’ll enjoy maxed out curb appeal and increased market value for your home as a result. Thornton has not been around as long as some of the other towns in Colorado that date back to the gold rush days but what it lacks in history it makes up for in the beauty of its setting and the pride and integrity of its residents. Thornton is a city steeped in the principles of organization and civic pride, respect for nature and respect for your neighbor as well as hard work for the greater good. We’re constantly striving for better ways to serve the residents of this forward-thinking community and our customers appreciate that. If you need garage door service or repair or if it’s time to install a new standard or custom garage door on your home give the pros at A Better Garage Door a call on 303-920-2267. We get the job done right first time every time. Call today.